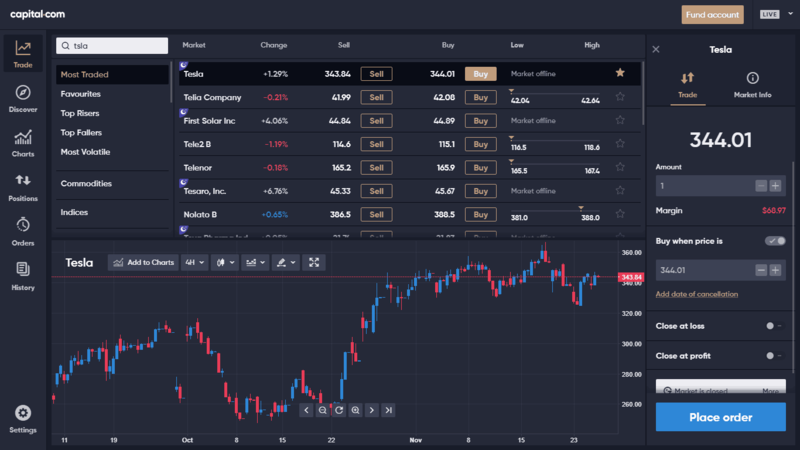 Founded in 2016, Capital.com is one of the easiest and cheapest ways to trade leveraged CFDs on equities, commodities, indices, forex pairs and cryptocurrencies anywhere in the world. Unlike other CFD trading platforms, Capital.com’s proprietary Negative Balance Protection means you’re protected when your positions drop, so you can never lose more than the amount you invest in your account. What are the main features of Capital.com? What fees/commissions does Capital.com charge? Traders use leverage to get big returns from small investments. Leverage allows you to take on larger positions than the money you actually put up. For example, if you buy an asset with 5:1 (20%) leverage, you can buy $5 worth of stock for every $1 you add to your account. That means if you want to buy $20,000 worth of a company’s stock, you only need to fund your account with $4,000 to do so. The beauty of leverage (also known as “buying on margin”) is that you reap all the benefits of the entire position, not just the leverage you’ve fronted. So if that stock position worth $20,000 goes up by 5%, all of those profits ($1,000) are yours to keep. Not bad when you only put up $4,000 to begin with. Since stocks are so volatile, they offer fairly low leverage, though other financial instruments—like forex pairs and indices, which tend to be less volatile—offer much higher leverage like 20:1 or even 30:1. For example, the EUR/USD forex pair trades at 30:1 (3.33%) leverage, which means you can trade $30,000 worth of it with just $1,000 in your account. When you trade with leverage, you always need to keep in mind that both your gains and your losses will be magnified much more than they normally are. If a stock that’s levered 5:1 increases 2% in a day of trading, your portfolio feels it like a 10% increase; similarly, 2% drops turn into 10% losses. These magnified losses can become a big problem for traders, which is where Capital.com’s Negative Balance Protection comes in. Negative Balance Protection protects users against losing more than they’ve deposited into their accounts, limiting the downside risk. What cryptocurrency trading can you do on Capital.com? Does Capital.com offer learning resources for new and experienced traders? Breaking News: You’ll find the most relevant news stories to the global financial markets here. Everything is up for analysis, from U.S. Federal Reserve news to important stories about world trade agreements. Capital.com TV: In addition to a suite of instructional videos, Capital.com TV includes dozens of news-based videos that examine how current financial events worldwide affect the price of securities, currencies and commodities. Is Bitcoin poised to make an upward move? Is oil ready to fall? What’s in store for Amazon this quarter? Are international political disputes going to disrupt European stock indices? These questions and many more are being discussed on Capital.com TV. Informative Webinars: Regularly scheduled sessions with market experts. Each week, you’ll find a fresh financial topic being put under the microscope, topics like trend analysis, short-term market scenarios, insights from expert traders, and more. Economic/Market Calendar: See country- and currency-based economic announcements listed in chronological order and rated for impact. Complete with official forecast announcements, these relevant events include U.S. Conference Board releases about consumer confidence levels, Bank of England speeches by ranking officials, EU financial pronouncements, unemployment numbers from national government sources and more. 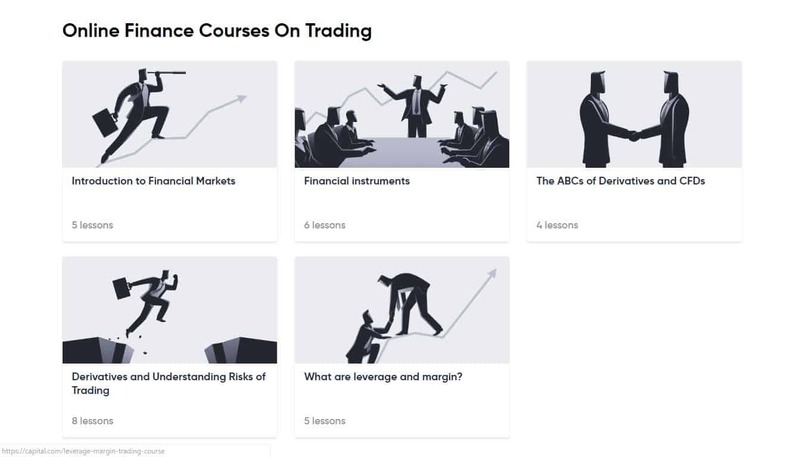 Targeted Financial Courses: Dozens of relevant lessons centered around crucial subject areas are available to help you learn more about financial markets, instruments of all kinds, the basics of CFDs and derivatives, the many risks of trading, the concept of leverage, and the mechanics of margin. Extensive Financial Glossary: A full trading glossary can help even the most seasoned trader stay informed about essential vocabulary used in the financial industry. Hundreds of carefully selected entries offer clear definitions of the most relevant terminology for anyone who wants to “speak the language” of finance. Comprehensive CFD Trading Guide: Learn about the detailed, unique aspects of CFD trading in this complete guide. There are core concept discussions about the nature of CFDs, short/long positions, how leverage works, as well as a fact-based listing of frequently asked questions about CFDs for beginners and experts alike. Real-World Guide to Cryptocurrency: This section offers a full-length discussion on the nature of crypto-CFD trading alongside detailed examinations of how and why to trade Bitcoin, Ethereum, Litecoin, and Ripple, four of the major players in the crypto market. It’s a must-read for anyone new to the world of crypto trading, and serves as a powerful review for people already familiar with this ever-changing market segment. How do I fund my Capital.com account? You can make your first deposit using a debit card, credit card, Bank Wire Transfer, Sofort, iDeal, Giropay, Multibanko, Przelewy24, QIWI, Webmoney, Trustly, 2c2p, or AstropayTEF as your payment method. Subsequent deposits can also be made via Neteller and Skrill. I funded my account using my N26 Black bank account, and the funds arrived immediately (within 30 seconds). How can I withdraw money from my Capital.com account? Capital.com always pays out withdrawals by the same payment method you used to fund your account initially, so if you funded your account using a bank transfer, they will process your withdrawal back to your bank account. If you’ve used several methods, the withdrawal will be sent to the one used last to top up your account. The full list of withdrawal options includes: debit card, credit card, bank transfer, Sofort, iDeal, Giropay, Multibanko, Przelewy24, QIWI, Webmoney, Trustly, Neteller and Skrill. What documents can I provide as my proof my address for Capital.com? What is the minimum and maximum deposits for Capital.com? Capital.com’s minimum deposit is 100 EUR, 100 USD, 100 GBP, or 400 PLN. Once you’ve verified your account (see above), there are no maximum deposit limits. Can I trust Capital.com? Is Capital.com a scam? Despite only being founded in 2016, Capital.com has already raised $25 million from VP Capital and Larnabel Ventures (mid-2017). The company is based in London, UK. Capital Com (UK) Limited is authorized and regulated by the Financial Conduct Authority (FRN 793714). Capital Com SV Investments Limited is authorized and regulated by the Cyprus Securities and Exchange Commission (Licence No. 319/17). How can prospective investors contact Capital.com? You can call Capital.com at +44 20 3870 3087 or email their support team at support@capital.com. You can also visit the Capital.com website and click on Contact Us for country-specific options and to enter a live chat with a Capital.com support agent. Their support team currently supports 13 different languages.